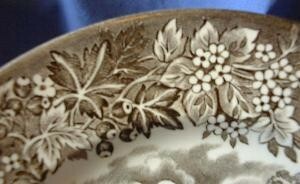 Click the button below to add the Brown Taupe Toile Transferware Boy Rowboat Mansion Vintage Plate S to your wish list. 6 3/4". Adorable vintage taupe brown toile motif with nice edge design. Made in Staffordshire England.